I am always encouraged by the number of people who reach out to me asking how they can help their friends. I often direct them to my blog because they can find advice to pass along on many different subjects. However, I realize that even people with the best intentions don’t always know how to offer advice in a way that is effective…in a way that others will actually listen and accept. 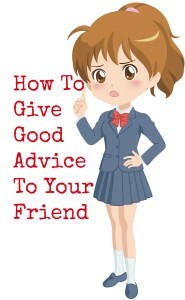 Have you ever tried to give someone advice, but they tuned you out or got really mad at you? 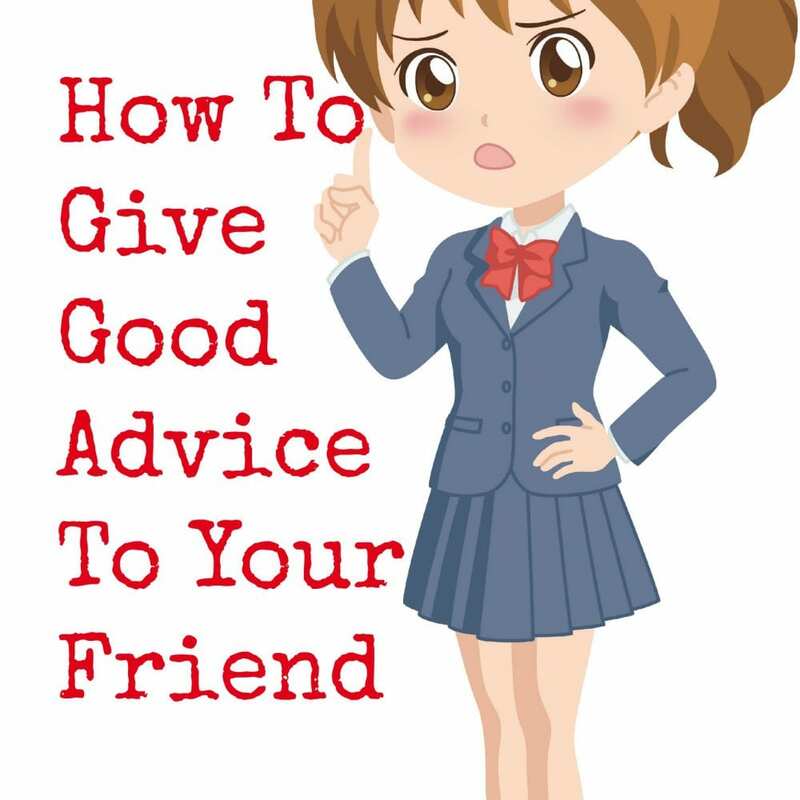 I have written this blog to provide some important tips for how to give good advice that is effective. This is a crucial place to start because unless someone is going to actually listen to what you have to say, your advice will not be effective. LISTEN. This is SO important. Unless a person feels heard and understood, they will never trust the advice you are giving. You must take time to gain an understanding of where they are coming from. Ask them questions to show you really desire to understand. Then state back to them what you’ve heard them say by summarizing, “So what I hear you saying is..Is that right?” This way you are both sure you are on the same page and they know you understand them. Ask them what they’ve already done to try to better their situation and why it may or may not have helped. Ask them what else they think might be helpful. Offer a suggestion of your own and ask them what they think about that idea. How do you think you would feel afterwards? Why do you think that is a good idea? PRAY for them and with them. I believe that with God’s power anything is possible. Any situation can be solved, any addiction broken, any heart mended, any wrong made right. Maybe not immediately and maybe not how we thought, but God tells us to bring our requests to Him. So PRAY and let them hear you pray! Don’t worry about anything; instead, pray about everything. Tell God what you need, and thank him for all he has done. Being Judgmental – Nobody will ever confide in you if they feel that you are going to judge them. You don’t know what they have experienced. Give them the benefit of the doubt. Preaching – Do not just talk atsomeone. Involve them in the discussion through lots of questions and listening. Offering a solution too quickly – It is important to really listen and gain a full understanding of all that they are struggling with, what their perspective is, and what they’ve already done to try to fix the situation. By saying, “Just do this and it will all be better,” you minimize a problem they may have been struggling with for a long time. Gossiping – If they are afraid you won’t keep their confidence, they will not tell you anything. Thinking you are going to fixthem or their situation – It is not up to you to fix anything. You just need to be a safe place where they can talk, receive support, and hear a new perspective on their situation. It is also important to be able to recognize common thinking errors and know how to challenge them as the advice giver. Over Generalization – Example: NOBODY likes me. Jumping to Conclusions – Example: He crossed the road to avoid me. Catastrophizing – Example: The meal was a complete disaster. They will NEVER talk to me again. All or Nothing – Example: The things I do are successful or a failure; perfect or disastrous; right or wrong. Challenge – Put a third option in between the two extremes – Successful, Good but needs a few improvements, failure. Turning a Positive into a Negative – Example: She would not be so kind to me if she knew what I was really like. I hope these tips will help as you reach out to make a difference in the lives of those around you! Our ebooks can help you learn more on specific topics and issues your friend may be experiencing. For example, check out this ebook on Self-Worth and Self-Hate. I need help, my friend is going through a nasty break up, I never know the right things to say to her, she gets mad because I feel like anything I say is wrong!